a migration may not be as much fun, but the hunt can still be productive. For the bowhunter, with our limited range equipment - the migration can make or break your hunt. Every year the same stories come back from Quebec. 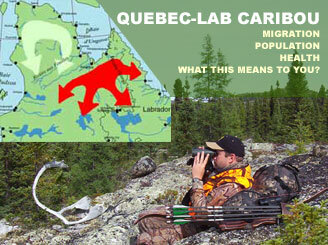 "We missed the migration" or "There were so many caribou that we tagged out the first day." Then there's the inevitable sales pitch you hear from the caribou outfits at sport shows: "We move you into the migration" or my favorite phrase muttered to dissapointed hunters in camp: "The caribou are on their way - just another day or two and they'll be here..."
With all the talk about the Migration, I thought it was time we looked at some data about the migration itself - where they go and when? what drives it? Is it really one big awesome spectacle or has it changed over the years? This article is largely based on data compiled over the last several years. We took that data and created the interactive caribou migration map (below) which reflects one particular study on radio-tracked caribou migration patterns in 2001. By no means should this data be used to predict future caribou movement as many factors can skew data such as weather, insect levels, even sampling errors within the study itself. But there was enough valuable data for us to decide to share it with you so you get a sense for the two major caribou herds in Quebec, their numbers, their health, and their annual migration patterns. COUTURIER, S., D. JEAN, R. OTTO and S. RIVARD. 2004. Demography of the migratory tundra caribou (Rangifer tarandus) of the Nord-du-Québec region and Labrador. Ministère des Ressources naturelles, de la Faune et des Parcs, Direction de l’aménagement de la faune du Nord-du-Québec and Direction de la recherche sur la faune. Québec. 68 p.
Using a combination of VHF (Very High Frequency) Radio Tracking Collars, along with Argos Satellite Collars, 229 caribou were tracked in 2001. 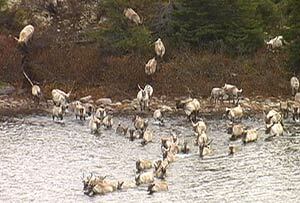 The caribou were tracked over several flights during the year. In addition to the tracking data from the collars, the herds were photographed and the caribou were counted in those photographs. The population results of the study are shown below in Table 1. **A greater discrepancy between the results for the alternative estimation methods was obtained for the Leaf River Herd. In a spirit of cautious management, we therefore recommend using the lower limit of the confidence interval for the estimate derived from the homogeneity model, i.e. 504 000 adults in July 2001 and 628 000 in the fall including calves, as a basis for herd management. During previous studies done from 1991-1993 the herd was estimated at around 1,000,000 animals. It was concluded in 2001, a decade later, that the herd numbers slightly more than 1,000,000 based on a conservative scenario. Migration occurs as a result of movement from summer to winter ranges and then back. Biting insects that harass the caribou in summer will force caribou to aggregate which helps to facilitate the migration. Herd health was determined by the carcass mass of lactating adult females. The study showed that the condition of caribou in the Leaf River Herd appears to have sharply declined since 1988, while that of the George River Herd has improved (table 3). In fact, between summer 1988 and summer 2001, the females of the RAFH lost 9.3 kg, whereas those of the RGH gained 8.1 kg. Summer 2002 appears to have been more difficult for both herds, although the George River Herd remains in better condition than the Leaf River Herd. Condition is also revealed by the mass and body size of calves. Between 1985 and 2002, the mass and body size of calves followed the same general trend as those in their mothers, i.e. the condition of the George River Herd improved and was generally better than that of the Leaf River Herd. While the total Quebec-Labrador Caribou herd has remained relatively stable during the last 15 years, the George River herd numbers have dramatically decreased while the Leaf River Herd have dramatically increased. This population trend will likely flatten and then reverse as data in this study indicate that the Leaf River Herd is pushing their range to levels where herd health is declining. The inverse is true for the George River Herd. In addition to what was presented in the study above, some interesting observations are coming from Quebec. Based on discussions with experienced caribou hunters, outfitters and biologists, huge migrations of caribou in Northern Quebec appear to be evolving into smaller, more dispersed groups of animals. While large, isolated bands of caribou may still be experienced in Northern Quebec, the more realistic expectation is more hunters experiencing more groups of fewer caribou. If you were expecting to see 5,000 animals pass by your river crossing - you may be disappointed. If you are looking for a challenging hunt and the opportunity to see a consistently decent number of animals - you may be in luck!